A sculpture of Chickasaw Chief Piominko stands in the park on the north side of the Tupelo City Hall. The sculpture was created by William N. Beckwith, a widely honored artist, who lives and works in Taylor, Mississippi. The annual meeting of the Union County Historical Society (UCHS) featured a program about the Chickasaw Indians, a native American tribe indigenous to north Mississippi. Mitch Caver, an author who has co-written a book about Piominko, an 18th century Chickasaw chief, spoke to the historical society members gathered for the society’s annual luncheon meeting, Friday, May 18th, at New Albany First United Methodist Church. 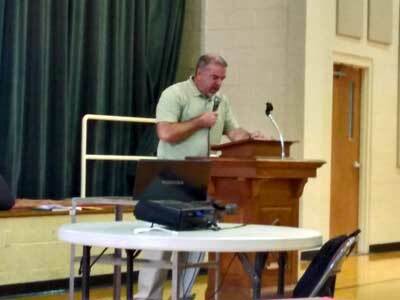 Mitch Caver, Chickasaw researcher and co-author of “Piominko: Chickasaw Leader,” addresses Union Co. Historical Society. Caver and Thomas W. Cowger wrote the book “Piominko Chickasaw Leader.” Piominko was born about 1750 at Longtown, a Chickasaw village on the south side of what is now Tupelo. Chief Piominko was involved in some of the earliest Chickasaw contacts with white Americans, including George Washington. Piominko was gone from the scene before the Chickasaw tribe was removed from Mississippi to Oklahoma in the 1830s during the administration of President Andrew Jackson. Two representatives of the Chickasaw Nation from Oklahoma attended the Friday UCHS meeting. The Chickasaw Nation has honored Caver as an honorary member of the tribe. Vance Witt, UCHS board president, opened the meeting and introduced UCHS Vice President Jim Henson, who gave a brief report about UCHS and its Union County Heritage Museum. Henson told of the building expansion project started in July, 2015. The $1.1-million project increased the size of the Union County Heritage Museum on Cleveland St. to a total area of 10,000 square feet. Henson said the museum formally took possession of the expanded space in January, 2017. The expansion added a substantial amount of exhibition space, a spacious meeting room, offices, a library, and a new handicap access entry on the west side of the museum complex. The museum is widely considered among the finest such facilities of any small city in the United States. Jill Smith, Director of the Union County Heritage Museum, presented a service award to the New Albany Rotary Club, which manages the annual Rubber Duck Regatta, an annual UCHS fund-raising event that occurs during the autumn Tallahatchie River Fest. Director Smith also introduced Caver as the guest speaker.